For players and coaches who were part of the 1999 national champions, the improbable title run provided a bond that remains strong. That Alfie Michaud and Ben Guite were driving together last week somewhere through Canada was not surprising. 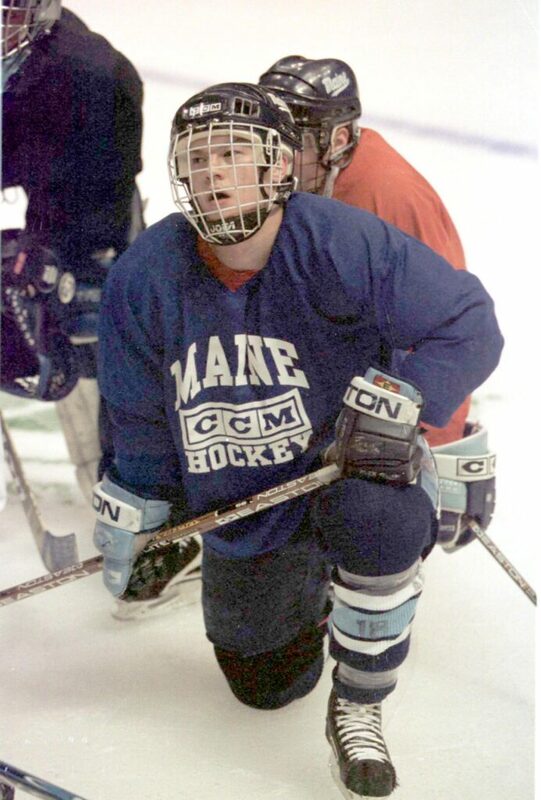 They are assistant coaches on the University of Maine men’s ice hockey team – Guite, the associate head coach to Red Gendron – and were on a recruiting trip, though they wouldn’t say where. 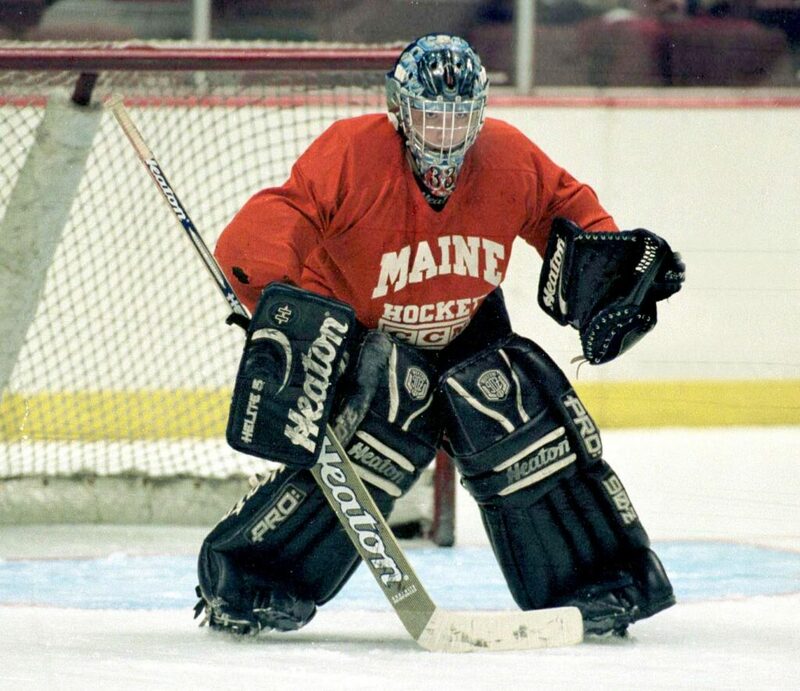 “I’m where hopefully no one else is,” said Michaud, the former Black Bears goalie. But Guite and Michaud didn’t need a recruiting trip as an excuse to be together. They are members of the 1999 NCAA champion men’s ice hockey team that made an improbable run to a national title. 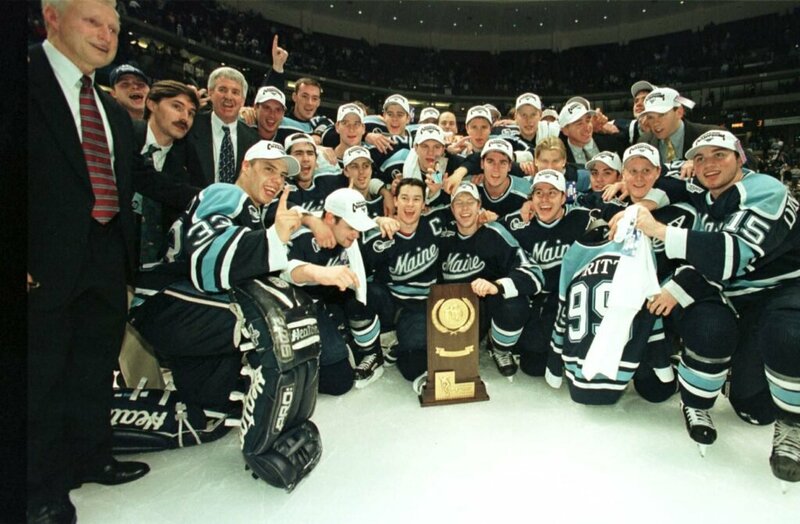 The Black Bears defeated rival New Hampshire 3-2 in overtime in Anaheim, California, on April 3, 1999, to win the program’s second national championship. And its last. The Black Bears weren’t all misfits. 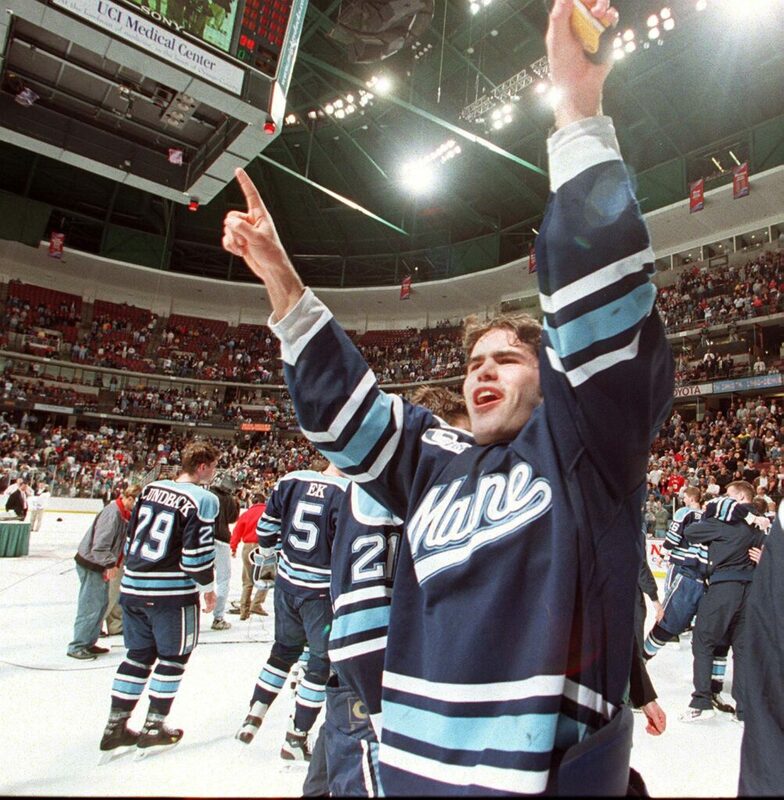 Maine didn’t have the top-tier talent of the 1993 championship team, which featured Paul Kariya, Jim Montgomery, twins Peter and Chris Ferraro, Garth Snow, Mike Dunham and Chris Imes. 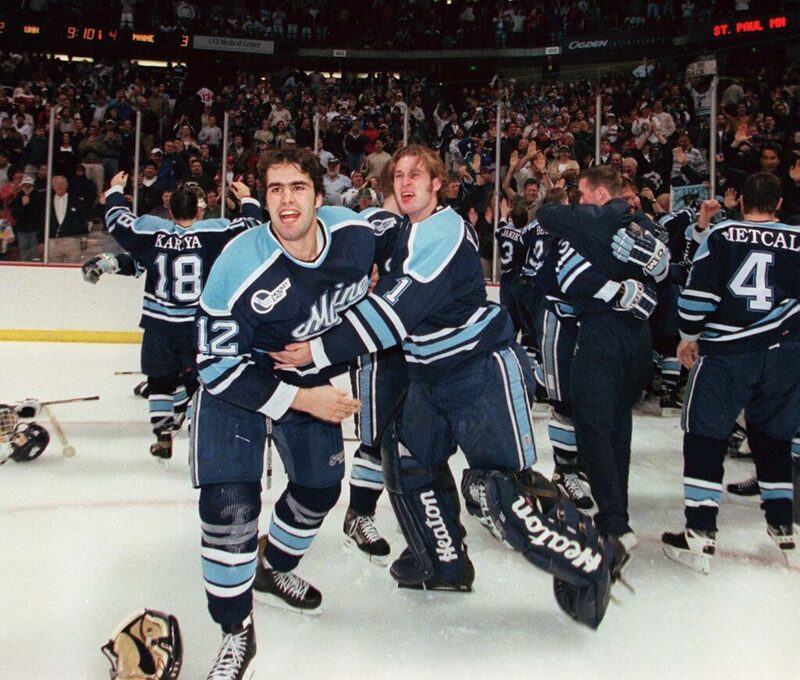 But the 1999 Black Bears had two first-team all-America selections in Steve Kariya and David Cullen. Nine players went on to play in the NHL. And Maine was picked to finish second in the preseason Hockey East poll. But it was also a team still rebounding from NCAA sanctions, slapped on the program in 1995 for violating NCAA eligibility rules. The team lost scholarships, was banned from the NCAA tournament and television for two years and saw Coach Shawn Walsh suspended for a year. Several of the team’s top players left the program after the sanctions were put in place. And that is what made this 31-6-4 championship team so special. This might have been the greatest coaching performance by Walsh, who died in September 2001 of complications from kidney cancer. He knew when, and how, to challenge his players to play better. And that’s what made this team appealing. Matt Taylor, a 911 dispatcher for the Portland Police Department, was 14 in 1999. 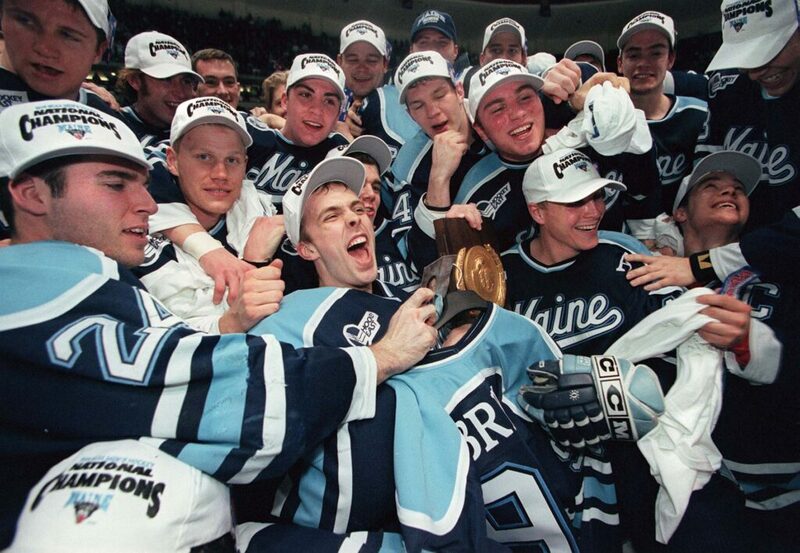 This was the first UMaine hockey team he followed. “It didn’t have the household name,” he said. “This was a working class team and that appealed to all blue-collar Mainers. And not just in the Bangor area, but in Southern Maine too. Now retired, 81 and living in Florida with his wife, Joy, Standbrook still stays in touch with every player on the roster. He hopes to be able to travel to Montreal in July when the players get together to celebrate the anniversary of their championship. Standbrook brought in some talented freshmen – Niko Dimitrakos, Barrett Heisten, defensemen Peter Metcalf and Doug Janik – to go along with veterans like Kariya (who led the team with 27 goals and 38 assists), Jason Vitorino, Marcus Gustafsson, Bobby Stewart and Cullen. Brendan Walsh was eligible after sitting out a year after transferring from Boston University. “That was the only time I ever won a championship as a player,” said Kariya, now 41 and a pro scout for the New York Islanders, scouting West Coast NHL and AHL teams. “After I retired, I coached one year with the Portland Winterhawks (of the western Hockey League) and I was fortunate to win one there. Two things struck me about those teams – the closeness of the players and how much they worked for one another, how much they enjoyed spending time together every day. The Black Bears were also pretty tough. “I know that any team who played us was bruised for a few days,” said Standbrook. Maine was coming off a 17-15-4 season. But the players came into the season believing they could contend for a championship. The Black Bears got off to a 25-3-4 start in 1998-99 before losing twice at rival New Hampshire, 6-1 and 4-1, to finish the regular season. Then Maine lost 3-2 to Boston College in the Hockey East championship game. Maine received an at-large bid to the NCAA tournament. Michaud made 20 saves as Maine defeated Ohio State 4-2 in the first round. The next night, Kariya had three goals and three assists in a 7-2 rout of Clarkson. And it was on to California. The Black Bears defeated BC 2-1 in overtime in the national semifinals, a goal by Dimitrakos tying the game in the third period, Stewart winning it in overtime on a pass from Dimitrakos. Then Maine faced its neighbor, New Hampshire, in the championship game. Goals by Guite, in the first period, and Dimitrakos, in the second, gave the Black Bears a 2-0 lead. But New Hampshire tied it on goals by Darren Haydar, in the second, and Mike Souza, 3:33 into the third. On to overtime. And the Black Bears weren’t fazed. Gustafsson, who was one of five seniors who stayed in Orono despite the NCAA sanctions, ended the game at 10:50 of sudden-death overtime when he slammed his rebound past New Hampshire’s Ty Conklin. Corey Larose sent the pass to Gustafsson, whose shot went into Conklin’s pads. As Conklin lunged for the rebound, Gustafsson reached out and put the puck into the net. And the celebration began. Kariya said he looked back and saw everyone celebrating – players, coaches, support staff and fans.